Tofu Fa (豆腐花) is a traditional and popular Chinese treat, made from soybean. It's silky smooth and nutritious. Many people like eating, yet hesitate to make it by themselves as there are many steps to take: soaking, blending the beans (not too difficult) and squeezing out the liquid (quite tricky). If any scums are not filtered out clearly, you can’t enjoy a smooth tofu fa. Here’s a simple and quick way to make smooth and yummy tofu fa with a high success rate. Bring unsweetened soya milk to a boil. Be cautious as soya milk will easily overflow when it boils. Put gypsum powder and potato starch into 100 ml water. Stir thoroughly. Put them in a large bowl. When the soya milk boils, foaming rapidly, pour into the gypsum powder and potato starch water, about 1 foot above. This action will make all the ingredients mix together automatically and nicely. Don’t move it or stir the mixture after pouring in the boiling soya milk. Cover it with a cloth to absorb steam as the picture shows. Let it stay for 40-45 minutes. The soya milk will settle to be smooth and yummy tofu fa. Heat a sauce pan to melt some rock sugar to your taste. You can also add 2-3 pieces of ginger if you like (a traditional way to prepare syrup for tofu fa). When the tofu fa is done, add syrup and/or dark brown sugar and serve.. Enjoy ! 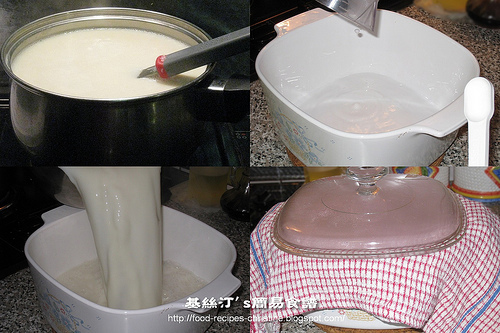 Before pouring in the boiling soya milk, make sure the gypsum powder and potato powder won’t sit at the bottom. Mix thoroughly! When soya milk boils, it will easily overflow. Be cautious. It’s better not to cover it when it’s going to a boil. After pouring in the boiling soya milk, don’t touch or stir it. Cover it with a cloth that would absorb the steam and make the surface of tofu fa look better. Hi Christine, I've tried to look for the gypsum powder, but i can't seem to find it in Sydney. Are you able to post a picture of it and the name of it in Chinese please? Thank you. I've discarded the plastic packet and stored the gypsum powder in a jar without shooting any photos of it. I'll take a photo when I buy some more anyway. BTW, you should get it at any Asian stores in Sydney, I think. It's called 石膏粉。 You might ask the staff to help you locate it. Excuse me,can you please tell me if there are any differences between cornstarch or potato starch?Will the results be affected if I used cornstarch instead of potato starch? Both cornstarch and potato starch can be good thickening. Potato starch can produce clear and smooth effect. I made this recipe the first time and it turned out OK. But the following two times it did not coagulate correctly. It came out to be much too watery. I used 2 heaping teaspoons of gypsum and about 3 teaspoons of corn starch. Could I be using too much gypsum or corn starch? I like the tofu fa to be a bit more firm. Thanks for the recipe, it did taste just like store brought the first time. Carefully check what you have done in the whole process. Check if there were any differences between the first time and the second time you cooked this dessert. For example, were the soy milk you used different in the second time? Were the temperature of soy milk and the steps not right? Check them carefully. Check if there are any other ingredients in Silk Unsweetened soyamilk. If so, you can set the soy milk. I m always trying out your recipes n i m real fan of yours. Honestly, I had tried so many other recipes from books to internet. None of them works; complicated ingrdient & difficult steps. Because i m young (less than 25), i gave up easily n depends on my mum. Just recently, i found your site n start cooking. Yours is the best i would say. I had tried more than 5 recipes of yours n still counting. I would like to thank you sincerely. As you know, I m not good at estimating things/water. Roughly how much you would put for rock sugar n dark brown sugar for this recipe? 30gm each? Thanks for your love of my recipes. I'm so glad to know that my blog encourages you to cook and enjoy cooking. Well, just give you an idea, you might start with 750ml boiling water, add about 85g rock sugar. Simmer until all sugar dissolved and bring the water down to 500ml. The desired sweetness all depends on individual preference. So you have to taste by yourself while cooking. Add more raw sugar or boiling water to adjust the sweetness of syrup. Just play around. After a few trials, you know how you like it and know how to cook to your taste. 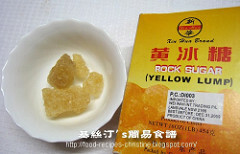 I am unable to find the gypsum powder at the chinese/asian stores unfortunately. but they asked me if it was lactone. do you know if it's the same thing? Thank you so much for posting this recipe. I just tried it and it came out fantastic! Tastes just like my mom made it from scratch. Also, thank you for posting all your other recipes. I now live 3,000 miles away from my family and crave Cantonese dishes from when I was little. I'll trying some of your other recipes in the near future. wow this recipe relatively look easy. But I followed exactly the same step as what u did. my tau foo fa is too soft and it did not coagulate as smooth as yours. it has spots and rough. How to make it to be harder and smoother??thanks. If you followed the quantity of all ingredients suggested and steps to follow, it could be the soya milk you used that was not smooth enough. The soya milk has to be very pure and smooth in the first place. It can't be set properly otherwise. Hi, you are running a great blog, love your recipes. I just tried making this using freshly made soya milk but it didn't coagulate properly, it was like lumps. You think is due to the smoothless of the soya milk? Any sugestions? Great, you made soya milk by yourself. The key to have smooth tofu fa is to get your soy milk really silky-smooth. Drain it through a fine sift for several times. Hi Christine, i just discovered your site and i can not wait to try the recipes u've shared! thanks!! I'm 15 years old and I want to make tofu-fa since I haven't ate it since I was like 8 years old. Yesterday, I tried but I failed. So I was search online and found your website which it really helpful to me. I was wondering is really matter while type of soy milk I use?? Where I live doesn't have any asian market. So can you recommend me some soy milk that I can find in supermarket like wal mart? and it turn out to be great like yours? please...Thank you. When it comes to make tofu fa, the soy milk we choose is very critical. It has to be very pure and it should be no other added ingredients into it. Otherwise the soy milk can't be set. 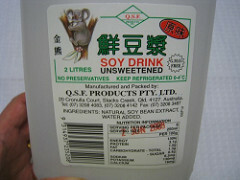 The soy milk that I used, shown in the picture, was produced in Brisbane, Australia. It works all the time for me. If you're not living in Brisbane, you might look for some pure soy milk available at supermarkets. Read the info at the back carefully before you buy it. Be sure that it has no other added things in it. Or you could make soy milk yourself. I really enjoy your blog! Thanks for sharing your recipes and tips! I am getting the ingredients for your Tofu Fa recipe. In this recipe, you have writen to use "Potato Starch" but at the grocery store, I only saw "Sweet Potato Starch" - that is not the item you want us to use, right? Then I went to your Chinese Blog and the 豆腐花 recipe has us using "生粉". When my internet translate "生粉" it shows english as "Cornflour". Can you please verify the correct flour I should be using? For this recipe of Tofu Fa, I used "Potato Starch". Here's the photo for you, there's a line in Chinese "一級生粉" on it. Potato starch and cornflour are two different flours. Christine - Thanks for responding back. What is the purpose of the Potato Starch? Can it be remove from recipe and just use gypsum? Potato Starch is to make the tofu fa smooth. love your recipes, they bring back all the "home cooked" memories. question for this recipe, is it ok to use sweetened soy milk? or will that affect the outcome? Can someone please tell me how much is 100 cc in millitres (ml)? i tired your recipe twice and i love it but, i was wondering if the gypsum powder doesn't dissolve, does that means it's not a good brand or my water isn't to hot? cuz i boil the water to about 180 degrees F. when i bite into the tofu i taste the powder on the bottom, and also i use corn starch is that ok? The gypsum powder is very hard to be dissolved in water, so give it a good stir, then immediately pour the boiling soy milk over it. Don't let the gypsum powder any chance to sit at the bottom. That would be fine. Yeah, if there's any problem in the ingredients or procedures, it won't set. Hey Christine. I'm trying to make my own soy milk. But I'm not sure how much soy bean to use for X amount of water. Here's the recipe for making Tofu fa only, not for making soy milk. I went out and bought all the ingredients today (i had to ask a staff member at the asian grocery store to help me find the gypsum powder)and it turned out exactly as your pictures! am so happy :) thanks again for all your recipes! Thanks for this, I'm looking to try this recipe today. I reads other receipe that suggested using agar powder and gelatine, any thoughts on this? Also should I add more Gypsum powder if I want my tofu a little firmer? The other way of making tofu fa is to use agar powder. I also have posted this kind of method on my Chinese food blog. But mind you, the texture produced is quite different from the traditional one. It's much firmer. When do you transfer the mixture to a container in step 3? Before you pour in the gypsum mixture? Before step 3, give a good stir of gypsum powder mixture and transfer into your big container, immediately pour the boiling soy milk over the mixture. Silk is a brand of soy milk available in supermarkets in the US. It WILL NOT work for this recipe as it contains all sorts of additives and, more importantly, has been processed for shelf stability. Coagulation is a chemical reaction which requires heat, and in this case, must reach a certain temperature. The soy milk must reach a full rolling boil or it won't be coagulate. Boil for 5 minutes to be on the safe side. "Pure" soy milk (type found in Asian markets) which won't coagulate, despite full boil, may be too watered down or may contain unlisted ingredients. Try a different brand. The starch is added to smooth out the texture and it also helps to stabilize the result. The starch keeps the tofu fa from watering out too much if it sits for a day or two. i can't seem to find gypsum powder? where to buy it? Thank you so much for the tofu fa recipe. I love this dessert & always want to learn how to make it....made it yesterday & it was yummy! Can't believe it's so easy to make! Again thank you so much for sharing!!!! Christine@Christine's Recipes: Thanks! I hope I can find one here. I did it exactly the same way using exactly the ingredients suggested & it didn't set. Am very upset cos was looking forward to my lovely Tofu Fa. The unsweetened pure soy milk was bought from a tofu retailer that manufacture it's own tofu. I wonder what went wrong with the tofu fa. Disappointed. Sorry for hearing about your experience. Really understand how you felt because I was in a similar disappointing situation once. To be honest, I used this recipe for many many years, and made this dessert for my family and friends for countless times. 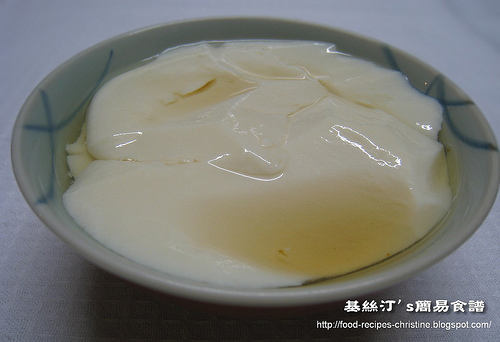 Every time we enjoyed smooth and silky tofu fa without any problem since my first attempt with success. With full confidence, again in a social gathering at my place two years ago, I planned to make tofu fa to entertain my friends. When I removed the cover, I was shocked and found that the soy milk didn't set well as usual. So embarrassing! It's the same recipe, same procedures....I was very sure that I didn't make any mistakes. At the end of the day, glad that I could sort out what went wrong in that time of cooking. The only thing I did differently was that I changed the brand of soy milk, as I couldn’t get the usual one, just grabbed a box of soy milk from a supermarket. Surprisingly found out there’re some other ingredients, other than soy, mixed in the product. No wonder that tofu fa didn’t set. I should've read the ingredient labels on the packet first. That’s a lesson I learnt in a hard way. When it comes to making tofu fa, the purity of soy milk is as important as the temperature of it. Please don’t get me wrong, I’m not drawing conclusion and saying that your soy milk was not pure, as I’ve no idea of how your soy milk was like. It could be something else went wrong. Why so hard to mix it? Oh, sorry for hearing the bad news. Do you know what went wrong ? Hey Christine, I love all Ur receipt!! Great work. Thanks for your kind words. You're so nice. I'm not a person who can cook under pressure, might not keep my fingers intacted if I enter the competition, haha..
Is there a certain temperature that you bring the soya milk to when it boils? Also, do you bring the milk to boil at high or low heat? The first time when I did it, the tofu fa settled but it was not very smooth, i.e. there were holes on the top layer. The second time I used soya milk that was previously frozen (don't ask me why) and the tofu fa did not settle at all :( Thank you! and i love your recipes.. I simply cook the soy milk over medium high heat until it boils vigorously, then immediately pour into the gypsum powder mixture. The texture of tofu fa depends on how smooth the soy milk you used, nothing related to the temperature as far as I know. Probably, the "holes on the top layer" were the air bubbles created while pouring in your soy milk. I've been looking forward to trying this recipe for the whole week!! Unfortunately haven't been able to find gypsum powder anywhere. I live in Sydney and have been to all the Asian grocery stores in Chinatown and flemington. Is there anything I can use as a substitute? Does anyone in Sydney know where I can get it? I tried making this recipe today. The tofu fa set but it isn't as smooth as yours. It looks a little flaky. When I added some sugar syrup little bits of the tofu came off. Did I do something wrong? Would it be the tofu? Where did you get the calcium sulphate? Seems that your calcium sulphate was not doing the job properly. I got in online as I couldn't find in at any asian stores in Sydney. The tofu fa is ok, it is a bit firmer that what i like. If i decreased the calcium sulphate would that change the texture to a smoother/ less firm tofu fa? Gypsum powder in this recipe helps coagulate the soy milk into pudding, and the amount of it controls the consistency. Use less if you want less firm tofu fa, or vice versa, more for making firmer tofu fa. I live in sydney was having problems finding gypsum powder. I tried looking for it in asian grocery stores, but they didnt sell it. I finally read online that those chinese herbal medicine stores stock it. I did find it in one of these stores, but they had it in crystalised form, and they grinded it into powder for me in the store. If I make my own soymilk out of soybean, will i get more pure and smooth soymilk? How do I do that? If you make your own soy milk, that's the best as you can be sure it's 100% pure. But make sure it has enough soy and make it smooth enough. Btw, potato starch is a kind of powder, looks like flour, that is extracted from potatoes. The reason why tofu pudding will not set is because of the ingrediants found in the commercially produced soybean milk affects the setting process. The soybean milk needs to have a certain level of protein and fat in order for the coagulants to work. If the soybean milk is too light it won't set. You may be able to overcome this partially by gently boiling off some of the liquid before adding to the gypsum liquid. Fresh unsweetened pure soymilk is best, don't buy the ones in longlife cartons that contain thickeners etc. Trial and error is the only way to find out which brands of commercial soymilk works best. The soybean milk does need to be brought up to temperature (rolling boil) before being "quickly poured from a height" into the gypsum and tapioca flour. The term "quickly poured from a height" is important and this ensures that the soymilk and gypsum liquids gets mixed thoroughly. Instead of adding the boiling soymilk into the gypsum and potato starch water, can i do the other way round i.e. pouring the mixture over the boiling soy milk? It's very hard to combine all ingredients in the shortest time if you do the other way round.